You see.. Diplomatic documents often demand close linguistic analysis. Would that Point 7 have meant something else, had it said that “There SHALL be no right to secede from the Federation.”? “It is unfortunate that the idiomatic use [of these words], while it comes by nature to southern Englishmen (who will find most of this section superfluous), is so complicated that those who are not to the manner born can hardly acquire it; and for them [this] section is in danger of being useless. In apology for the length of the remarks it must be said that the short and simple directions often given are worse than useless. The observant reader soon loses faith in them… and the unobservant is the victim of false security." Would such a reading of my argument, if it is the correct one, turn POINT 7 into a “mere recommendation” that SABAH & SARAWAK continue to be part of the Federation of Malaysia when there is no reasons/causes to trigger their need to SECEDE FROM THE FEDERATION?? 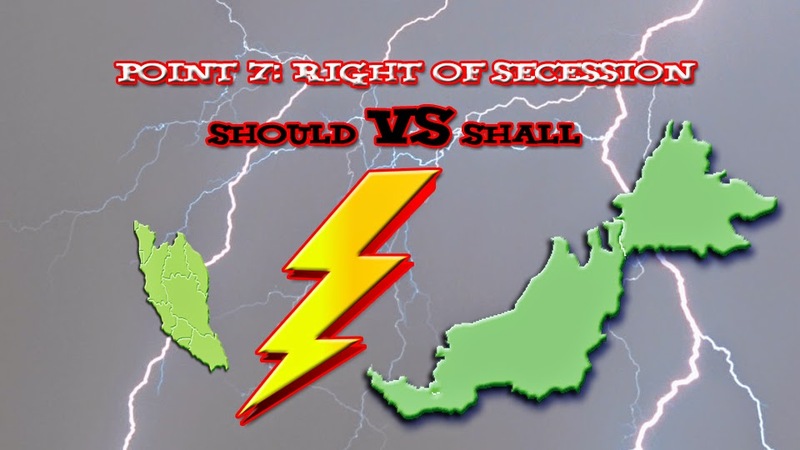 If POINT 7 intends to say that SABAH & SARAWAK need not secede from the Federation unless it wants to, then it also intends to say that SABAH & SARAWAK need not continue to be part of the Federation of Malaysia unless it wants to — a construction of POINT 7 that would be rather bizarre, to say the least. True, in practice, as opposed to theory, the difference between “shall” and “should” in British English is somewhat different: “shall” often expressing a COMMAND on the speaker’s part, and “should” merely a DESIRE, as in “You shall go to the doctor” vs. “You should go to the doctor.” And yet if we paraphrase POINT 7 as saying, “The Point 7 of the Agreement of Malaysia desires that Sabah & Sarawak not to secede from the Federation,” is this significantly better for Sabah & Sarawak? How big an improvement over flouting the POINT 7’s command would be flouting the POINT 7’s desire? ?